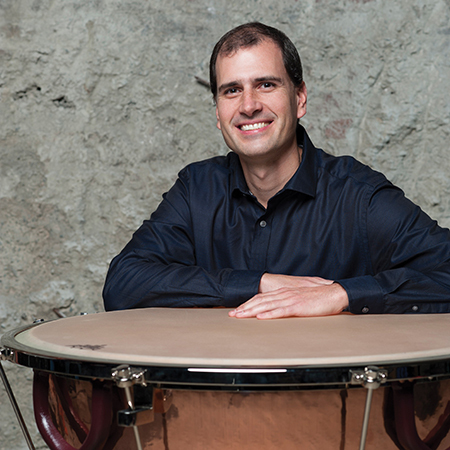 Principal Timpanist with the Vancouver Symphony Orchestra since 2007, Aaron McDonald* has over 15 years of experience teaching percussion to students of all ages and levels. Aaron currently teaches percussion at the University of British Columbia and runs a successful private studio. He has also worked with young percussionists at several Vancouver schools including Lord Byng Secondary and Windermere Secondary and the percussion section of the Vancouver Youth Symphony Orchestra. He has given masterclasses at the Manhattan School of Music, the Shepherd School of Music at Rice University, and the Shanghai Conservatory of Music. Aaron earned his Bachelor’s Degree in Music Performance from the University of Missouri, and a Masters in Orchestra Performance from the Manhattan School of Music where he studied with Chris Lamb of the New York Philharmonic and Duncan Patton of the Metropolitan Opera. He also studied in Cleveland with Tom Freer of the Cleveland Orchestra. He has performed and toured with the Cleveland Orchestra, Los Angeles Philharmonic, Indianapolis Symphony, and the Buffalo Philharmonic. In Vancouver he has performed with the Turning Point Ensemble, Standing Wave, the National Broadcast Orchestra, the Music on Main concert series, and recorded several film scores with the Vancouver Film Orchestra. Along with his extensive study and performance experience on all classical percussion instruments and drum set, Aaron has also studied West African drumming and South Indian frame drumming.